The Sydney Theatre Company and Commonwealth Bank present a Sydney Theatre Company and Melbourne Theatre Company production of THE FATHER, by Florian Zeller, translated by Christopher Hampton. August 24 - October 21. THE FATHER, is a play written in 2012, by French playwright and novelist, Florian Zeller. It won the Moliere Award for Best Play in 2016 and has had an international life of some reputation. It has been translated into English, by Christopher Hampton - his play, LES LIAISONS DANGEREUSES (1985) being his best remembered work. Andre (John Bell) was once an engineer. He lives in Paris, in an apartment he bought 30 years earlier. Or perhaps he lives with his daughter, Anne, and her husband, Antoine. Or was he a tap dancer whose daughter Anne, lives in London with her lover, Pierre? Whatever the living arrangements, he's still wearing his pyjamas and he can't find his watch. Reading, that information, the idea that we are about to see a play that may be a psychological thriller, or, possibly an inheritor of the conundrum of the French absurdest play tradition, say, Ionesco's THE CHAIRS (1952), rises in one's consciousness. Both of the above might be the truth of the experience in the theatre. 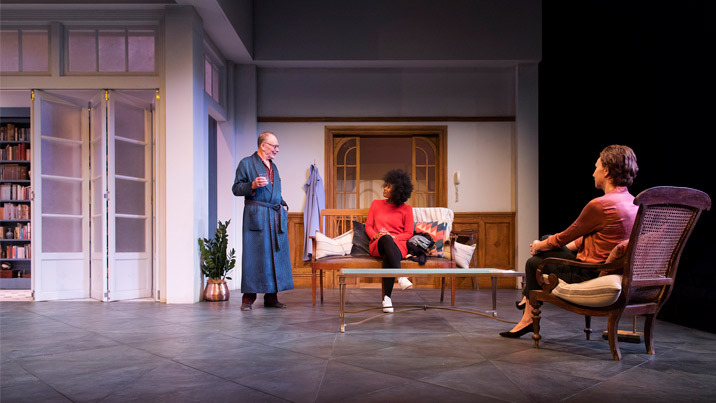 For from the beginning, the offers of the Set Design, by Alicia Clements, of a middle-class Parisian apartment are slightly askew. Subtly, but askew. There is something just a little odd about the look, the furnishings. One has, after all many memory references from recent French cinema of the middle class Parisian apartment: ELLE (2016), THINGS TO COME (2016), AMOUR (2012), CACHE (2005). THE FATHER, is made up of some fifteen scenes of various lengths and after the darkness between each, accompanied by an eerie Sound Design (Steve Francis), subtle shifts of organisation of the rooms has happened. It is subtly disconcerting and it undermines one's confidence of what one has seen previously, of what is true, what is real, of what usually has helped, to make secure, to build a belief system to enter the world of the play, the usual 'rules' of the normal game of make-believe in the theatre. Andre, a retired engineer, is looking for his watch. He is urgently in search of it for he tells us that he had always had two watches, the one on his wrist and the one in his head - he always knew the time, the 'when' of his life. As this play unrolls one is not so sure that he has that grip on both his 'watches' anymore. He, we, meet his caring daughter, Anne (Anita Hegh), her partner, Pierre (Marco Chiappi), his carer, Laura (Faustina Agolley) and two others, Glenn Hazeldine and Natasha Herbert, who may not be who they say, and/or Andre believes they are. This is a play about the experience of dementia. For those of us living with it through the health of parents and friends, and the personal fear that it might be happening to one self. THE FATHER, can be, is a very difficult, confronting time. For what Florian Zeller manages is to place one in the mind (head) of Andre. The gathering accumulative journey that one has, as an audience, is the feeling of losing one's mind where the reality we are watching is not consistent and so is distractingly frustrating and panic inducing. It is a marvelous piece of writing. Listen carefully to the dialogue repetitions, and their subtle changes. Christopher Hampton, translates the 'tricks' the verbal constructs of Florian Zeller with wonderful skill - all is not secure. John Bell, playing Andre, creates a man of masculine aggression, a man not, necessarily easy to like, a man whose difficult personality traits become magnified as he flounders in a bewildered whirl to find an equilibrium to his waking moments that ultimately dwindles into a pathetic (empathetic) figure of need and child-like wanting. It is a performance that keeps one at a distance, and whether it is one of 'logical' rejection or simple fear of the future, that position cannot but be challenged with the final moments of the production. One can be moved to tears. Whether it is one of empathetic embrace or fear, will be an individual choice. The company of actors are uniform in their simple and straight-forward tasks that present the world of the scenes of the play with naturalistic clarity - no comment, no 'flourish', little to no sub-text, and Director, Damian Ryan trusts that the writing embodied by his actors will create the affect of the play's intentions, balanced by a subtle Lighting Design, by Rachel Burke, creating a visual offer that can create a sense of unease and doubt. At 90 minutes with no interval this is a play of enormous skill that can shatter one's confidence about the future - indeed, one's own in a very visceral way. The production serves the writer with a bleak hand of consistent restraint. N.B. : There is a twined play by Mr Zeller, called THE MOTHER (2015), which, too, examines a contemporary social issue of a commonly experienced confrontation. It is worth reading (or, perhaps seeing).